This is an extremely rare Burleigh Ware preserve pot produced in the 1930s in their Burslem factory. It is backstamped correctly and has no impressed number. As can be seen, the little bearded pixie or gnome is lying atop the lid of the pot. Dressed in a green tunic with brown leggings. 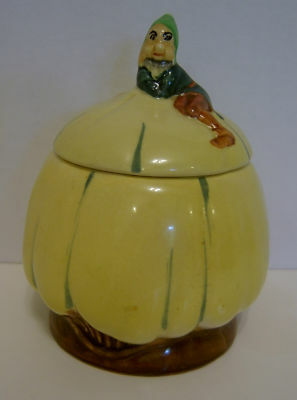 The pot has a yellow ground with green slender stripes set on a brown base. This is an item which would go very well with the Crown Devon pot I also have on this site and which dates from the same period. It measures 4 inches (10 cms) to the top of the finial and has a base diameter of 2.5 inches (6.5 cms). It is in excellent condition with no chips nor nibbles.